CNN’s Christiane Amanpour on Tuesday confronted Egyptian businessman Naguib Sawiris over the jailing of three al Jazeera journalists in that country. 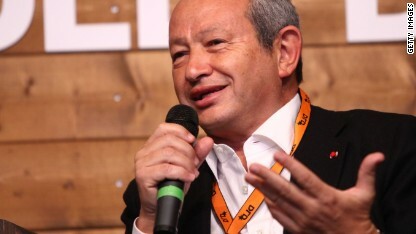 Sawiris – one of Egypt’s wealthiest citizens, founder of the Free Egyptians Party and former chairman of the telecom giant Orascom – provided financial support for the opposition to former President Mohamed Morsy. Peter Greste, Mohamed Fadel Fahmy and Baher Mohamed from Al Jazeera English were arrested by Egyptian authorities on December 29 and have been held since. Egyptian authorities say the journalists held illegal meetings with the Muslim Brotherhood, which was declared a terrorist group last month. Sawiris raised doubts about the journalists’ credentials to be in the country, and said that al Jazeera was “fabricating” stories. Click above to see Amanpour’s full interview with Sawiris. Spying by America’s National Security Agency does not have “anything to do with terrorism,” Glenn Greenwald, the activist journalist who broke the story, told CNN’s Christiane Amanpour on Monday. The latest revelations of American spying involve the alleged taping of German Chancellor Angela Merkel’s personal mobile phone and that the U.S. gathered data about 60 million Spanish phone calls in a single month, which comes after similar reports from France. Greenwald, formerly of The Guardian, has been systematically publishing reports of secret American intelligence gathering since he was given a treasure trove of leaks by former intelligence officer Edward Snowden. The senior British official who asked the Guardian to destroy hard drives containing leaked information about the NSA was “acting on behalf of the prime minister,” David Cameron, Editor-in-Chief Alan Rusbridger said on Wednesday. Rusbridger said that the official, whom he said has now been identified as Jeremy Heywood, the cabinet secretary, first contacted him in mid June. The Guardian complied, physically destroying the hard drives – Rusbridger has even tweeted a photo of a dismembered Macbook Pro. Did UK government target journalist? Was Glenn Greenwald, the reporter for The Guardian who broke story of secret NSA surveillance, targeted by the UK government? His partner, David Miranda, was held for nearly nine hours at London's Heathrow Airport on Sunday. CNN's Hala Gorani, sitting in for Christiane Amanpour, discusses the question with Brooke Gladstone, the host of NPR's "On the Media" in the U.S.
For generations journalists have risked their lives and given their lives – covering wars, human disasters and uncovering dark and ugly crimes. Over the past several years the targets of these stories have increasingly turned their guns on the truth-seekers: the journalists. Exactly one year ago veteran foreign correspondent Marie Colvin – a legend in journalism – was killed by a shelling attack in Syria. French photographer Remi Ochlik was killed alongside her. British photographer Paul Conroy, who survived that attack, says he is sure they were specifically targeted. The Committee to Protect Journalists says 70 journalists were killed in 2012, a 49% increase from the previous year. 232 journalists are imprisoned around the world and 35 are missing. A new campaign called "A Day Without News" is trying to raise awareness and bring penalties to those who target journalists. One of the leading voices in that campaign belongs to New York Times photographer Lynsey Addario. In the video above CNN’s Christiane Amanpour speaks with Addario about the campaign and discusses how she and three of her colleagues were abducted while covering the Libyan revolution and held for six terrifying days. Veteran anchor Tom Brokaw kept tabs on his colleague, Richard Engel, from the first days of his captivity in Syria, he told CNN’s Christiane Amanpour on Tuesday. 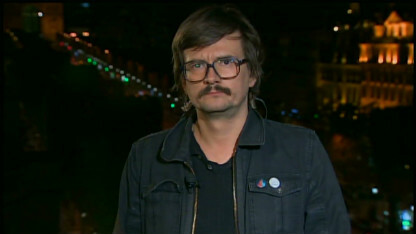 Engel was freed on Monday after five days of captivity in Syria, where he was reporting for NBC. Engel believes his kidnappers were members of the Shabiha – the militia allied with Syrian President Bashar al-Assad – and that his captors hoped to exchange him and his team for Iranian agents held by the Syrian opposition. It is the nightmare that shadows all journalism organizations and reporters who cover the world's danger zones. For more than two decades Tom Brokaw was the anchor and managing editor of NBC Nightly News. He oversaw Engel from his first days at the news network. Brokaw said he was overjoyed when Engel was released, but added that there is an extremely delicate balance between a reporter’s safety and the important work of doing journalism on the front lines. The Committee to Protect Journalist says this was one of the deadliest years for journalists: Sixty seven have been killed covering stories this year. The French cartoonist known as "Luz" defends his Mohammed drawings in an interview with CNN's Christiane Amanpour. 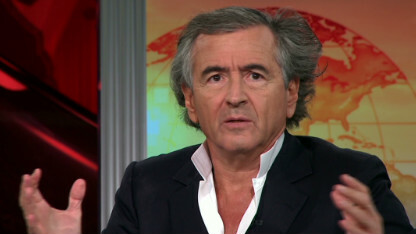 Journalist and author Bernard-Henry Levy weighs in on the cartoons recently published in a French magazine.